Am I obligated to reserve through Physimed’s website in order to have a consultation at the walk-in clinic via the link available on your website or can I call or just present myself ? 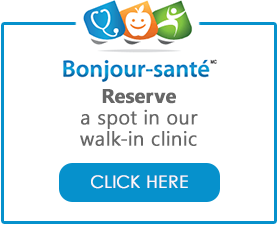 You are strongly advised to reserve your time zone to have a consultation at the walk-in clinic via the link available on our website http://www.physimed.com Please click on the icon “Bonjour-Santé: Reserve a spot in our walk-in clinic” to start your reservation. If you are not able to do so, you can always present yourself in person at the emergency clinic before 10 am in the morning. We will try to accommodate you by giving you an appointment if there are still places available, but unfortunately we cannot guarantee it. I have a file and I am registered with a family doctor who follows me at Physimed, can I book an online time slot to have a consultation at the walk-in clinic? If you have a file with Physimed and you are registered with a family doctor following you at Physimed, you are privileged; you can go to the Physimed website and reserve a spot for the walk-in clinic from 9:45 in the evening to have a consultation the next day. Once you arrive at the clinic for your consultation, please report to the clinic’s reception to notify your presence. I have a file at Physimed but I am not registered with a family doctor who follows me there, can I reserve an online hourly range to have a consultation at the walk-in clinic? If you have a file with Physimed but you are not registered with a family doctor following you, you can go to the Physimed website and reserve your spot for the walk-in clinic from 6 am to have a consultation for the same day. I don’t have a file at Physimed, can I book an online time slot for a consultation at the walk-in clinic? If you do not have a file with Physimed, you will not be able to book online, via our website, a time slot for a consultation at our walk-in clinic. You can present yourself directly to our walk-in clinic before 10 am in the morning so we can open a file for you. We will try to accommodate you by offering you a consultation for the day even if there are still available places at the clinic. Once your file is created, you will be able to reserve your time slot at the walk-in clinic through the link on our website. There are no more available spaces when I try to reserve a time slot at the walk-in clinic via the Physimed website, what are my other options? If there are no more availabilities during your booking attempt, we invite you to try again the following day, from 6 am. Otherwise, you can try to present yourself directly to the walk-in clinic before 10 am in the morning. We will then try to accommodate you by proposing a consultation if a time range becomes available. You can try to reserve a time zone again via Physimed website during the day in case time slots become available due to cancellations from other patients. I have a file at Physimed but I do not have access to a computer or a smartphone. How can I reserve a time slot at the walk-in clinic? Thereafter, the system will be able to find you a time slot at the Physimed clinic if there are still available. I’m really not feeling well, can I get ahead of my consultation time at the walk-in clinic? If you have any doubts about your health status, we invite you to call 8-1-1. An info-Santé nurse will advise you. Once your time slot is reserved for our clinic, you are not able to get ahead of it. What happens if I am late for my consultation at the walk-in clinic? If you are late for your consultation at the walk-in clinic for more than 10 minutes, the clinic may reserve the right to refuse your visit in order to preserve the schedule for subsequent bookings and avoid delays waiting for the following patients. I am not happy with the time of consultation that was given to me, is it possible to change it? Take note that booking a time slot through our website is intended to allow you to get the fastest consultation to see a doctor at our walk-in clinic. The proposed time is therefore unique; you have the choice to either accept it or to refuse it, but you cannot change it. However, if the time does not really suit you, you can try again later and see if the proposed new time is right for you. However, you should be aware that if all the time slots are taken, no new time range will be offered at the time of your new test. I have reserved a time slot via Physimed website for a consultation at the walk-in clinic, will I receive a booking confirmation? If you have reserved a time slot via Physimed website for a consultation at the walk-in clinic, you will receive an email confirmation of your reservation and a text confirmation if you have checked the option of receiving information by text message. I received a confirmation of consultation by email and text message, is it possible to cancel it or to change it also by text message? Please note that it is not possible to change a time-range reservation at the walk-in clinic. If you cannot attend the consultation, you must cancel your registration. Cancelling an hourly reservation can only be done by email and not by text message. Therefore, to cancel your reservation, please return to the email you received beforehand to confirm your consultation at the clinic and click on “To cancel your appointment”. You will subsequently receive a confirmation of the cancellation of your hourly range reservation at the Physimed walk-in clinic by email. You will also be able to receive this booking cancellation confirmation by text message if you have checked the option to receive the information by text message. When I go to the clinic at the time indicated in my booking, will I pass immediately or will I have to wait? As a general rule, we do our maximum to respect the hours of reservation of the hourly range at our walk-in clinic. However, emergencies or unexpected contingencies may cause small delays.